It’s that time again. Getting organized for school next week. Uniforms, supplies, lunch boxes – check, check, check! Last year I bought a Laptop Lunch box for Daniel and we absolutely love them. 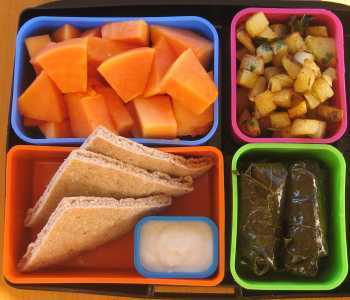 It is an American-style bento box that includes an array of compartments in appealing shapes and colors. It also comes with a book of healthy lunch ideas and lunch making tips and recipes. Best thing is I no longer have to use plastic bags, plastic utensils or disposable drink containers that add to the landfill because all parts are reusable, recyclable and dishwasher safe. Did you know that an average school-age child using a disposable lunch generates 67 pounds of garbage per school year? This equates to 18,760 pounds of lunch waste for just one average-size elementary school. This year I bought Daniel an extra water bottle, and extra containers so I don’t have to wash them every night and I got Sadie a Daisy lunch kit. If you are local and interested I believe you can find some at Greener Living in Lakewood or buy them online at http://www.laptoplunches.com/ and get a 10% discount off your order just enter coupon code “veganlunch”. Now that Daniel will be going to elementary or ‘big boy school’ I am obviously concerned about the nutrition he will receive while at school. There will be snack and lunch time during the day. I’m not sure how snack time works yet but sounds like parents alternate bringing snack for all students to share. Daniel has a peanut allergy so that will eliminate many of the packaged snack choices. Most likely we’ll be packing both snack and lunches. If you have any great ideas post them on the comments. I always need some more. I know there will come a day that I am tired of packing lunches and Daniel will want to eat the school food. Have you seen school food lately? Lots of processed stuff filled with chemicals that somewhat resembles food. Ick. If you watched Jamie Oliver’s Food Revolution in the spring 2010 maybe you have an idea of what I’m talking about or maybe you have witnessed it first hand. Bright pink milk and pizza for breakfast! Thankfully, Dallas ISD has begun to make small changes. They say the menu next year will include brown rice and whole grain breads, vegetarian options daily and homemade sandwiches. That is a start but we have a long way to go. Hopefully I’ll feel comfortable letting him eat school food occasionally but until I see more radical changes I’ll be packing lunches most days. Hope everyone is enjoying the last few days before the kids go back to school!